thankfully, my thirty fifth quilt is complete with no further injuries. 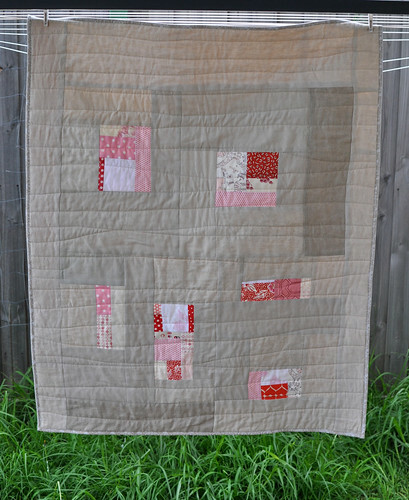 i started work on this one at the same time as no.034, working with leftover pieces of red and pink patchwork from a previous quilt, but instead of slicing the blocks in half, this time i left them whole. 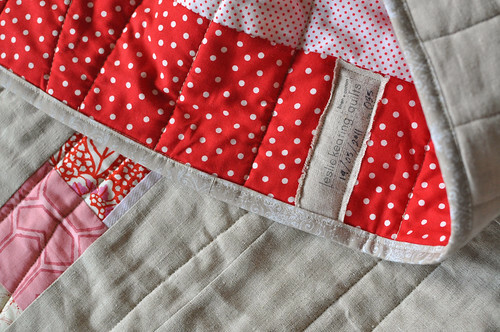 i forgot to mention it when i wrote about no.034 but i used two layers of batting in both these quilts and i absolutely love the loft and absolute squishiness it gives them. the organic cotton batting i use is quite thin and i really would prefer something thicker but with a half a (giant) bolt left, i think i'll be using two layers until i can find something that is just right. 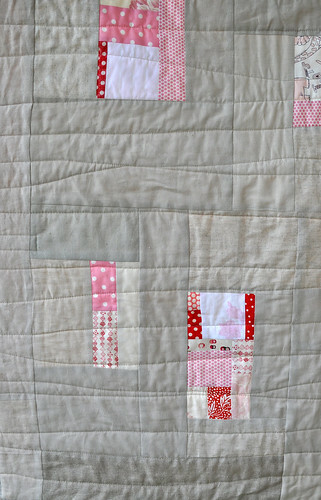 it's an extra layer to baste and makes the quilting a tiny bit more challenging but worth it in the end. i've decided both of these cushy quilts will be available in my shop update on june 1 since i have very little else to show for the month of may. they are baby/toddler sized and i think would be so lovely as an heirloom gift. would like to write more but i have a three year old perched on the arm of my chair, putting her blanket on my head and giving me silly kisses, time to go! Love it all, the colours, the quilting, everything. Beautiful Leslie, I love it. I adore your colour schemes - I wish I had your vision. I must learn to machine quilt, I'm only on quilt 2!! Love your colour combinations leslie. 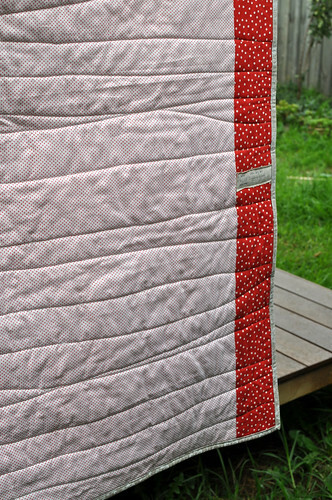 Do you use linen for the main part of the quilt? Where do you get your linen? I've found it really difficult to get nice linens. kylie, i stocked up on serious meterage last time i went to canada (and will be doing so again in august since all their summer fabrics will be 50% off) but i've bought it from darn cheap fabrics and even spotlight before (spotty usually has a 50% linen 50% cotton that is decent). i've also been searching out linen clothes at oppies to chop up and mix in with my new linen, i like to have a variety of shades and textures.